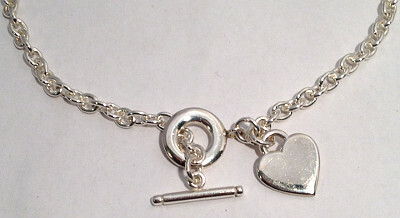 Heart Tag Large solid Sterling Silver Ladies Necklace. Classic Heart Tag design on a solid 6mm gauge width classic Belcher Necklace chain at 460mm length (18inch). T-Bar pull-through large 18mm round Toggle securing Necklace. Massive 1.5oz Heart Toggle solid 925 Silver Necklace. Amazing size and weight looks Stunning!